This book is number two for me in the Summer of the Canadian Short Story challenge over at Write Reads. And, it is my first Margaret Atwood book on this blog. I have read and loved many of her other books, but this is the first of her short story collections that I have read. 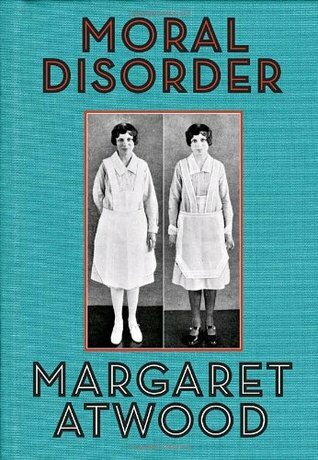 I’ve had Moral Disorder on my shelf for quite some time, so I’m glad that I have finally read it. Moral Disorder is a short story collection in which the stories are inter-related. It traces the course of Nell’s life, but also involves the lives of others who are connected to her in some way; her parents, her sister, her husband and his ex wife, her real-estate agent, and even her animals. These stories give us snapshots of different times in her life; the birth of her sister, school, living on her own, living on a farm, life with a partner and his children, helping with her aging parents. This book is not what you would call a page-turner. Instead, reading it feels like sinking down into a big comfy couch with a mug of hot chocolate, while watching an episode of The Littlest Hobo. The two words that come to mind are pleasure and comfort. And, all the stories contain her trademark humour and wit. My favourite stories in the book were the ones that take place on the farm. In Monopoly, Nell and Tig run away together to the country. Tig is leaving behind his wife and two boys. It is a time of getting used to each other, adjusting to the boys’ visits to the farm, and trying to figure out if this is the life she wants. She’d been in love, a state of being she thought of as wiping the mind clean of any of the soothsaying abilities or even ordinary common sense it might otherwise have had. It was the marriage, which Nell pictured as a large thorny growth- a cross between a dense, dark-green bush or shrub and a thundercloud-shaped cancer, with the adhesive qualities of tile cement and a number of tentacles, like a ball of leeches. In Moral Disorder and White Horse, Nell and Tig buy and live on their own farm. With that come many amusing anecdotes about life on a farm. Maybe she would grow cunning, up here on the farm. Maybe she would absorb some of the darkness,, which might not be darkness at all but only knowledge. She would turn into a woman others came to for advice. She would be called in emergencies. She would roll up her sleeves and dispense with sentimentality, and do whatever blood-soaked, bad-smelling thing had to be done. She would become adept with axes. Between the two of them, Nell and Gladys (her horse) passed their riding time pleasantly enough. It was a conspiracy, a double impersonation: Nell pretending to be a person who was riding a horse, Gladys pretending to be a horse that was being ridden. The last two stories in the book are about Nell’s parents coming to the end of their lives. They are full of familiarity and nostalgia. It could be any of us in those stories. The Labrador Fiasco is especially amusing as it describes her aging father’s reactions as he listens to his favourite book being read to him. It is about inexperienced explorers going into the wilds of Labrador without having done their research. They know they’re going into danger, but they also know they are immortal. Such moods do occur, in the north. In The Boys at the Lab, her mother is bed-ridden, and they spend their time looking through her photo album, reminiscing. At that point, memories were all she had. Now she’s smiling. In there- at the end of the long dark tunnel that divides her from us- she’s off again on that wild gallop, over meadows, through orchards of apple trees in bloom, clinging to the reins and the pommel for dear life, her heart going a mile a minute with terrified joy. Can she smell the apple blossoms, in there where she is? Can she feel the air against her face as she rushes through it? Some of these stories took on new meaning once I found out that they are based on events in Margaret Atwood’s life. She lived on a farm with her partner for a while, and tells us in this interview that all the animals in the stories are real. Also, her father was an entomologist, like the father in the story. She spent much of her time as a child in northern Quebec surrounded by nature, like Nell in The Art of Cooking and Serving. Here is another review of the book that was written shortly after it was published. What are some of your favourite Margaret Atwood stories/books/poetry? 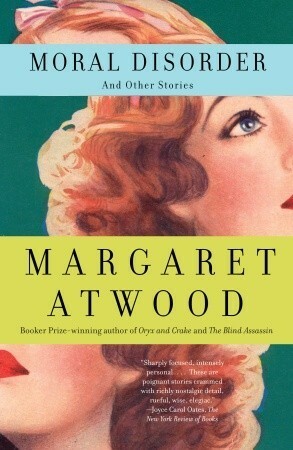 I love Margaret Atwood’s novels, but to my shame I have never read her short stories. These sound intriguing, especially the biographical elements. This collection was my first time reading her short stories, as well. But I will definitely be reading more of them! I thought the biographical element added just a little more interest to the stories. This sounds lovely, thanks for the review – something I am definitely going to pick up. I recently read Bluebeard’s Egg – another compilation of Atwood’s short stories and I liked them a lot. Oh, good to know you liked Bluebeard’s Egg! I have this on my shelf to read! Sounds wonderful, I have just picked up The Blind Assassin to read. Atwood is such a great writer! The Blind Assassin is a good one, too! I hope you like it! I haven’t read any of Atwood’s short stories yet. I like the idea that all the stories in this compilation are connected. I liked the format of the collection, as well. You never knew what part of her life you would be reading about next. I love her novel The Blind Assassin. She’s wonderful! It’s been a while since I read that one – maybe it’s time for re-read. There are several that I’d like to read again, actually! I’ve read many of her novels, but never her short stories. Thanks for the lovely introduction. I don’t know why it took me so long to try out her short stories. They’re great for short snippets of time! You are really racing along with these short stories! I’ll have a post about Bird in the House tomorrow 🙂 There are actual quite a few similarities between themes in this Atwood book as you describe it and in BITH. It would be interesting to do a comparison. When I heard you were reading BITH, I read the back of my copy (that I remembered I had under my bed, but have never read), and I did think they sounded similar. I am looking forward to your review! I didn’t know the stories were biographical until I was almost finished reading them. It was a nice surprise. Now, I am wondering which Atwood books to suggest to you (because I do love her). Have you read any? I thought of the MaddAddam Trilogy for you right away, actually. I don’t read a lot of dystopian/speculative fiction, but I did love those books. And, I think they are smarter and more grown up than what I have read of the YA versions of dystopia. Also, The Handmaid’s Tale is awesome, and my other fav is Alias Grace, which you have already read! I’d love to read this collection — thanks for pointing it out, Naomi! I love Atwood and if you EVER get the chance to see her speak do it! I just got an ARC copy of her new short story collection which I’m excited to read. I’ll definitely have to check this one out though. Oh, I’m envious. Can’t wait to hear about it! 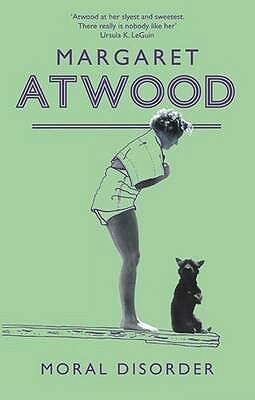 I don’t normally read Atwood’s short stories, but I did read this one and really enjoyed it. I’m not sure what I’m going to do about her new one. I am curious to hear what people will have to say about her new one, but I’d like to eventually read it. Her older ones, too! With the MaddAddam trilogy she gained so many new fans bc of the whole dystopian thing. I wonder how they’ll find her more traditional writing. I wonder that, too! It’s very different. Which is one reason I think she’s so great, but some people might not like that so much. 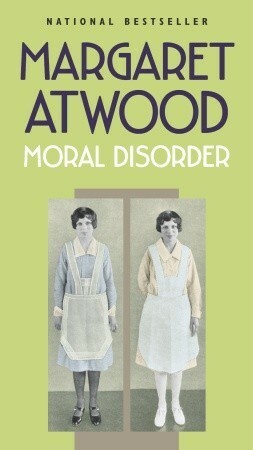 I’ve never read any of Margaret Atwoods short stories, looking forward to reading this one! Can’t really go wrong with Atwood, right? And she has so many to try. I like linked short stories. Good point. You really can’t go wrong with Atwood. Good review Naomi. Now I want to read the book and I rarely read short stories. I do love Atwood though. Like Care I enjoy linked short stories. You should give it a try! It’s a nice bridge between a full length novel and a short story collection. The challenge has been fun, and has gotten me to read some short story collections that I might not have otherwise, but am really happy that I did! I hope she does it again next year. Definitely check it out! I haven’t read Bluebeard’s Egg yet, so I am happy to hear that it’s another good one! I couldn’t resist. I’d be reading some short stories anyway, but there is something about an organized event that brings particular books to top of the stacks, isn’t there. Thanks so much! I’m so glad that you enjoy my blog! It makes a great second book, because you can put it down for a while in between stories if you want to. I also recommend Alias Grace and the MaddAddam Trilogy. Very different from one another. I have only read The Handmaid’s Tale but I have a few of her other books on my shelf (funny, I fell in love with Atwood before reading her books and started collecting them at book sales ;-)). I am intrigued by Cat’s Eye and want to read that next. Have you read it? I read Cat’s Eye so long ago that I keep thinking I should re-read it, because I really don’t remember it well. I remember enough to know that I liked it. If you do read it, let me know what you think! In my opinion, it’s hard to go wrong with any of her books. Ooh, I might try reading this collection for the summer challenge too. Unless I can get my hands on her new collection. I just finished reading my first Alice Munro collection and think it would be interesting to compare their writing. Oh, yes, you should! And, it’s a good one to use for a comparison, because I thought it was similar to Alice Munro’s tendency to write about ordinary life. But, if you can get your hands on her newest book, that would be interesting to hear about, as well! I have so many books on my TBR list though that there are some must-read authors I haven’t had the chance to discover! But I have recently ordered Alice Munro’s Too Much Happiness.Like Atwood,she is someone I’ve been meaning to read for months!! 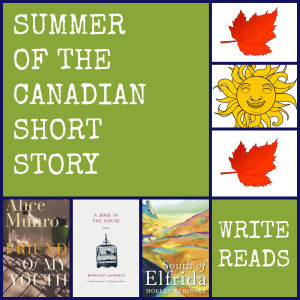 Would you say that Atwood’s short stories are like Munro’s? 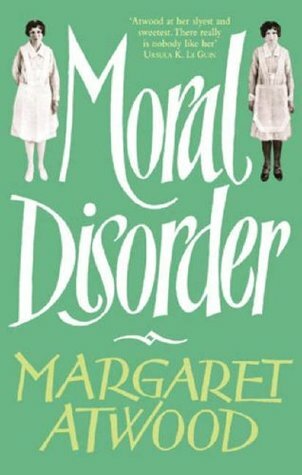 Moral Disorder was my first experience with Atwood’s short stories, so I can only speak for this one collection, but it did remind me of Munro’s short stories mostly in that they were about everyday life. There is probably a little more wit in some of Atwood’s writing, but not always. You can’t really go wrong with either one!